Sediba - a newly discovered ancestor? 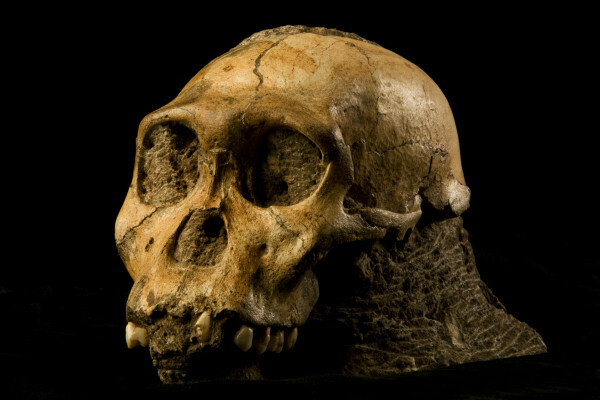 Diana - The 2 million-year-old Australopithecus sediba has been described. This transitional species of early human could link the two-legged Australopithecines, of which the famous Lucy was a member, to the early Homo genus. Lee - Well it actually happened after an organised search for sites. I had started a search back in early 2008, using Google Earth of all things, to look for new cave sites in the Cradle of Humankind area, just outside of Johannesburg. At that time, we knew of about 130 cave sites and about 20 fossil sites. By July of that year, by both using Google Earth and then going out, and ground tripping with my dog and I, just walking in these very remote areas, I'd found almost 600 new cave sites, and over 30 new fossil sites. By the end of July, I'd realised that an area very near to where I've been working for the last 20 years had a series of cave sites that I didn't know existed. And on the first of August, I visited them, and found the Malapa site, a site that had never been seen before. It was rich in fossils, but it had hardly been touched by miners. (This area had been sort of searched over by lime miners in the late 19th and early 20th century). On August 15th, we went back to the site - myself, my 9-year-old son Matthew, and my post doc, Job Kibii. A minute and a half later, my 9-year-old son said: "Dad, I found a fossil". And what he'd found was a collar bone, or clavicle, of an early hominid, and that started the whole thing. And since then we've been in this remarkable period of discovery. We've discovered, arguably the two most complete early hominids never discovered, as well as others, in what seems to be one of the richest paleoanthropological localities in the world. Diana - So, what did you do once you found these pieces? Did you take them back to the lab and analyse them immediately? Did they immediately seem different to you? Lee - Well, that's an interesting question. Under South African law, I had to get a permit, but I called the South African Heritage Permit Resource Agency at that time, literally from the site, and got permission to take the first block out. And we began preparing it here. These fossils - if you imagine, are encased in a very dense, concrete-like substance, and it was very soon that we realised we had a remarkable fossil, and that we had, what appeared to be, an associated skeleton that was in partial articulation. And I think, even early on, I realised that it wasn't at least, typical of what we usually find here in South Africa. (That is, one of the two species - Australopithecus africanus, the Taung Child or Mrs. Ples, or one of the robust Australopithecines, Paranthropus robustus which have those big saggital crests across the top of the head. It clearly appeared to be different than that. It would take us a while before we realised it wasn't something like Homo habilis, or Homo erectus, but an entirely new species. Diana - And how long did it take to come up with that conclusion, to compare all the species? Lee - That first discovery was a little over 18 months ago, and once we had the skull (and I discovered the skull in March of 2009) we had enough at that point, as we had two skeletons emerging from the rock, that we could compare it with everything that had been compared. I think really, the turning point was when my team and I were in the Kenyan National Museum. We just finished looking at all the Homo habilis material, all the material that had been attributed to some of these later Australopithecines, and we realised that what we were looking at was just not found in the range of anything that had been discovered. And we also began to see how unusual it was, in its patterning, to other early hominids. Diana - So, tell me why is this important? Where does it fit in the grand scheme of things? Lee - Well you know, firstly, these are probably the rarest sought-after objects on earth, and to have found literally hundreds of remains of them, representing a relatively small number of individuals - well that really gives us an unprecedented look into any period in human evolution. But of course, this occurs at a critical point in human evolution, right around 2 million years. In fact, these are dated to between 1.78 and 1.95 million, in fact, closer to 1.95 million years, and that has been a great missing area in the fossil record. Literally, there are only a few dozen fossils, most of them very, very fragmentary from that time period. But it's a critical time period; It's the period between where we have things like Lucy, or Little Foot, or Mrs. Ples. Australopithecines (with their relatively long arms and short legs, and not moving the way we do - really almost apes that walk on two legs) and then the emergence of what we call Homo erectus, that is something that is clearly very close to a direct ancestor, if not, a direct ancestor of ours, and it carries our body plan - a relatively large brain, small dentition and an advanced face. Well, sediba falls right in the middle there, and it interestingly carries combinations of both ends of that spectrum. It has these long orang-utan-like arms, short powerful hands, however, and long legs and a very advanced pelvis - in fact, a pelvis very similar to a Homo sapiens' or Homo erectus'. Its face is very advanced, its dentition is small, but it also has a very small brain, like an australopithecine. So, it's a mix of characters that appear to be both descendant from those earlier hominids, and unique, and derive to things like Homo erectus. Diana - The thing that struck me was, I think it was 9 years ago, another fossil turned up in Georgia, which was supposed to be sort of similarly intermediate. So, how do you think these two relate to each other, if at all. How can you even compare them? Lee - Well, Dmanisi is an intriguing question, and has been. Some people have said it's an early Homo erectus, some people have said it's an absolutely unique species, and I think that's exactly where we should be comparing Australopithecus sediba next, because anyone who looks at them can see a lot of similarities in the face to Dmanisi. Dmanisi does have a larger brain than ours. It does seem to be derived a little more towards Homo erectus, or at least on its own pathway in that direction, but you know, I think sediba might make a very good candidate ancestor, because the big question was, where did Dmanisi come from? It didn't look like a descendant necessarily of Homo habilis or Homo rudolfensis, or some of these other things. Diana - And kind of course it's 7,000 miles away as well. Lee - Well, but you know, one of the big issues had always been that one of the problems that people had with Dmanisi and even later things like Flores is, you didn't have an ancestor that appeared to be a facultative biped - something that it come down on to the ground. The one thing with sediba's long legs and advanced pelvis, it's clear it's a very good walker, and it's the kind of thing that could be the type of hominid that expands throughout Africa, and potentially, will give rise to hominids that could leave Africa. Diana - And so, do you think there's anything else that might be in this area where you found sediba? Do you think there's more possibility of similar finds? Lee - Well, I can answer that, that's not even a question. In fact, we have at least two additional skeletons coming out and we haven't dug yet. The site is remarkably rich. It's a moment in time. It's an extraordinary event and it continues to give us a really remarkable record of this species. Diana - It seems hard to imagine so many different species of early humans with vastly different brain sizes, different teeth, and even different walking styles ,all living on the same planet at once. That was Lee Berger of the University of the Witwatersrand, where he's a Reader in Human Evolution. Ben - I had the good fortune to meet Lee Berger back in 2007, visiting him in his office in South Africa. He's got the most amazing collection of fossils, telling the story of our evolution.